Last weekend I attended a charity event called 'Food For Cause' held at our friends' home in Whitefield, Bangalore. The lovely hosts Sapna & Sajai Singh along with Sajai's mother demonstrated traditional Rajasthani dishes and served a sumptuous Rajasthani dinner. Here's one of the traditional recipes from Rajasthan given by the Singhs. Method of preparation - Add salt and ghee to atta and mix well. Knead into a stiff dough by adding water, a little at a time. Divide the dough into 12 portions. Shape each portion into a smooth ball to make 'baatis'. Place the baati on a greased baking tray. Heat oven to 200 deg celsius. Bake the baatis for 20 to 30 minutes till they get a golden brown color. Dip them in ghee while they are warm and serve warm with dal. 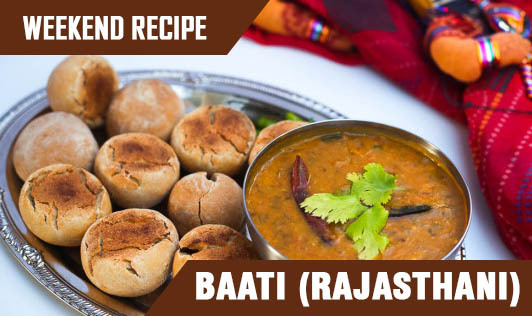 In Rajasthan, uncooked balls of baati are thrown over live coal and cooked. The outer layer turns black and is peeled off before eating with dal and ghee. Baati is always eaten with dal. Gatta curry is another traditional dish from Rajasthan which I'll write about next weekend. Try the baati meanwhile and let us know if you like it.